If the time has come to replace the gutters and downspouts on your Middletown, Ohio, area home, you’ll be pleased to know that there is a company you can trust to get the job done right — 31-W Insulation. Since 1972, we’ve provided area residents with first-rate home improvement service, including top-of-the-line products, expert installations, and stellar customer care. When it comes to your home, there’s no room for cutting corners, which is why we are committed to bringing our customers the very best. What’s more, our seamless gutter systems won’t pull apart over time like sectional gutter systems, meaning you can count on many years of optimal performance. 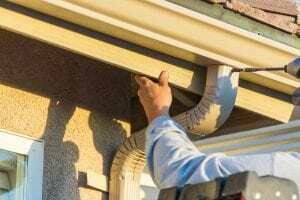 When you partner with 31-W Insulation to have the gutters and downspouts on your home replaced, you can rest assured that you are in good hands. We only trust installations to our company-employed technicians, all of whom have been thoroughly trained and will treat your home with the care and respect it deserves. Furthermore, your new gutter system will be covered by a 20-year limited manufacturer’s warranty, so you can take solace in knowing the investment you’ve made in your home is protected. To learn more about having new gutters and downspouts installed at your Middletown-area home, contact 31-W Insulation today. We are happy to answer any questions you have about our products, installation, warranties, and more.